What is Lymphedema of The Legs? A common problem cancer survivors face is post-operative lymphedema. 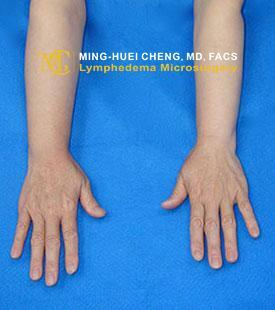 Lymphedema is caused by excess fluid that collects in the body’s tissue, causing swelling (edema). 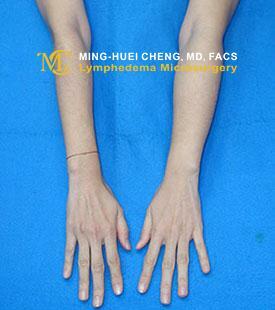 The symptoms are typically swollen limbs due to lymphatic circulation blockage. Some patients may also experience skin problems (eczema, rough skin, unidentified protrusion), repeated cellulitis or toe mold infection. Award winning plastic surgeon Dr. Cheng specializes in reconstructive surgery and is an expert in the lymphovenous anatomosis (LVA) technique, a minimally-invasive microsurgery procedure that can address the symptoms of lymphedema. Since lymphedema is not always treatable with non-surgical rehabilitation, LVA surgery can greatly improve the condition. 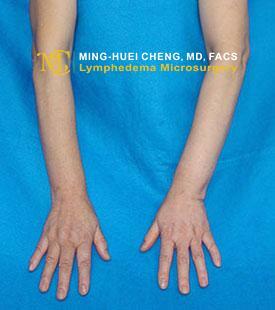 This is a 57-year-old female with left upper limb lymphedema for 12- months after left mastectomy and radiation. At a 15- months of follow-up, the circumferential reduction rates of the affected limb without the use of compression garments were 86% and 100% above the elbow and below the elbow, respectively. This is a 56-year-old female with right upper limb lymphedema for 10- months after right mastectomy and axillary 31 lymph nodes dissection and radiation. At a 36- months of follow-up, the circumferential reduction rates of the affected limb without the use of compression garments were 100% and 100% above the elbow and below the elbow, respectively. This is a 64-year-old female with left upper limb lymphedema for 12- months after right mastectomy and axillary lymph nodes dissection and radiation. This is a 39-year-old female with left upper limb lymphedema for 6- months after left mastectomy and axillary 31 lymph nodes dissection and radiation. At a 3- months of follow-up, the circumferential reduction rates of the affected limb without the use of compression garments were 35% and 60% above the elbow and below the elbow, respectively. For patients with grade I to IV lymphedema, an individualized treatment plan is determined based on imaging studies. Patients with grade I and early II lymphedema will undergo a lymphodynamic evaluation by indocyanine green (ICG) lymphography. The ICG injection allows Dr. Cheng to evaluate the presence and location of open, functioning lymphatic channels or dermal backflow (obstruction of lymphatic flow). This type of image study is performed via injections into the second and fourth web spaces of the fingers or toes. Images are obtained at 5 minutes, and then again after 20 hours. These image studies enable Dr. Cheng to create a customized treatment plan for each patient depending on their degree of lymphedema. How Does LVA Surgery Work? 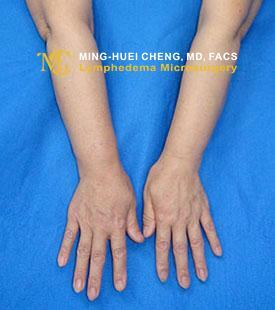 The most advanced, minimally invasive super-microsurgical techniques relieve lymphedema through small incisions (around 3cm). Preoperatively, ICG lymphography is used to map the lymphatic system on the skin and locate the incisions. Once the lymphatic channel and a suitable vein have been identified and prepared, a connection between them is created to give the lymphatic fluid an alternative route to escape from the affected area. The lymph fluid will then drain effectively through the vein. If LVA surgery is chosen for a patient, Dr. Cheng’s preference is to perform one or two Side-To-End (lymph-to-vein) anastomosis. Using super-microsurgery techniques, Dr. Cheng performs the LVA surgery so that the lymph can drain into the vein from both proximal and distal directions. Into the planned incision, allowing the lymphatic channels to be easily detected. The can then be seen draining from the lymphatic channel into the vein, confirming LVA surgery success. ICG fluorescence may also be used to verify a successful LVA surgery. ▲End-to-end (A and B) end-to-side (C and D) anastomosis are shown. The decision to perform one versus another is based on the intrinsic functionality of the native lymphatic and the inherent pumping mechanism. If the venous pressure is greater than the lymphatic pressure, the blood is regurgitated and causes the anastomosis thrombosis (B and D). Bidirectional lymph will flow into the vein in a side-to-end fashion (C and D). Data source: Principles and Practice of Lymphedema Surgery. Cheng MH, Chang DW, Patel KM (Editors). Elsevier Inc, Oxford, United Kingdom. ISBN: 978-0-323-29897-1. July 2015, page 63. As a member of the American Society of Reconstructive Microsurgery, Dr. Cheng is internationally known for his superior microsurgery techniques. If you would like to know more about LVA surgery and cutting-edge treatments for lymphedema, do not hesitate to contact Dr. Cheng’s office. Based on your individual case, Dr. Cheng will recommend the best treatment to reduce lymphedema swelling and improve your quality of life. The lymphatic system is vital to ensure a healthy body. It is responsible for circulating protein-rich lymph fluid though the body. During this process, it collects bacteria, viruses and waste. The fluid gets carried through the lymph vessels to the lymph nodes where the waste is filtered out by infection-fighting cells. The lymphatic system is part of the body’s immune system and a crucial aspect of a person’s health. 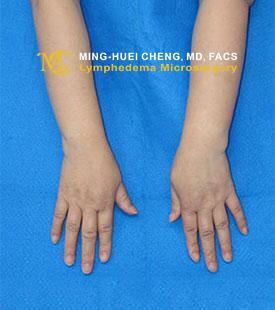 What are the causes of lymphedema? 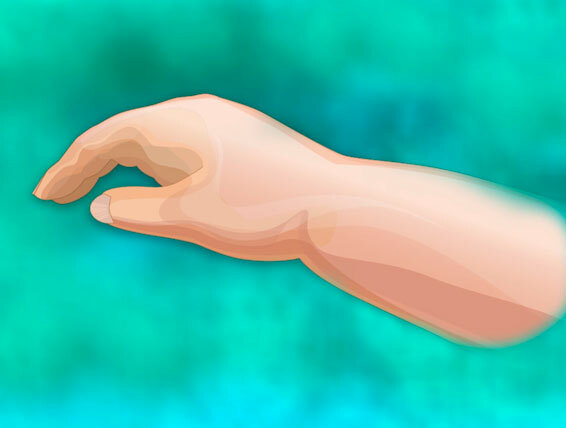 Lymphedema occurs when your lymphatic system is unable to properly drain lymph fluid. While primary lymphedema occurs on its own, secondary lymphedema, which is more common, is caused by a disease or condition. 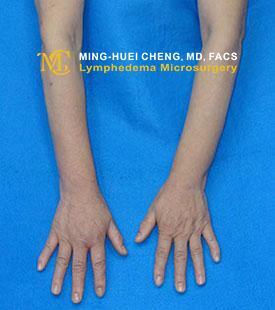 Secondary lymphedema is usually seen when the lymph nodes are removed, oftentimes as part of a cancer treatment. 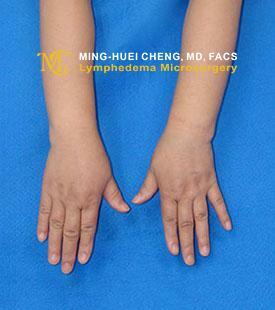 Lymphedema can also be caused by damage to the lymph nodes, from radiation treatment or infection. Should there be a blockage in the lymphatic system, the lymph fluid will not drain well. 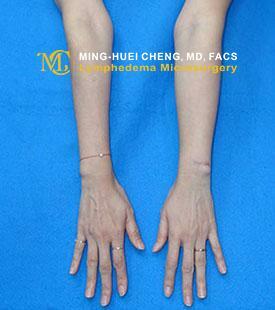 This leads to fluid buildup and swelling, which generally occurs in the arms and legs. How can LVA surgery improve lymphedema? LVA surgical approaches, like Dr. Cheng’s advanced LVA technique, are effective in reducing or eliminating lymphedema swelling and discomfort. The LVA method directly connects the lymphatic vessels in the affected area to nearby veins. This allows the built-up lymph fluid to drain, which improves the fluid circulation in the body. Typically, LVA is an outpatient procedure, with most patients returning home the same day as the surgery. 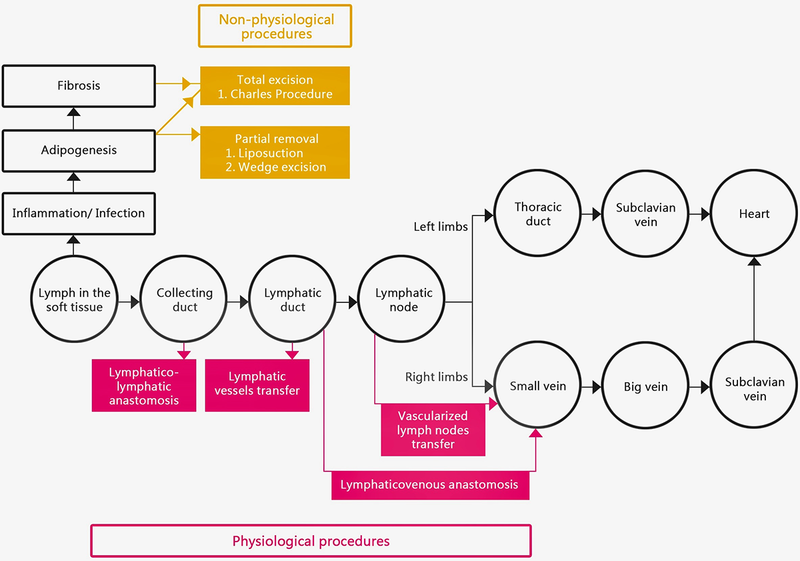 ▲The flow diagram represents the impact of both physiologic and nonphysiologic methods of surgical treatment on the lymphatic system. Data source: Principles and Practice of Lymphedema Surgery. Cheng MH, Chang DW, Patel KM (Editors). Elsevier Inc, Oxford, United Kingdom. ISBN: 978-0-323-29897-1. July 2015, page 218. Successful treatment of early-stage lower extremity lymphedema with side-to-end lymphovenous anastomosis with indocyanine green lymphography assisted. Ito R, Wu CT, Lin MC, Cheng MH.